This Green Pu-erh Beeng Cha was harvested from Wild Elephant Valley in Xishuangbanna. 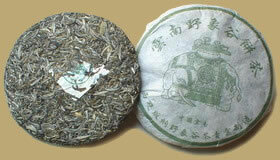 The tea has a high concentration of white tips, weighs about 357 grams each. As beautiful as it is fragrant, this special cake makes an aromatic treat today, or may be put away to produce what is sure to be a rare and valuable treasure in the future.